The alarm was set again for this morning so that we could try to catch up having stopped early yesterday. Our schedule is based on a seven hour cruise each day so there is room to expand should we need to. 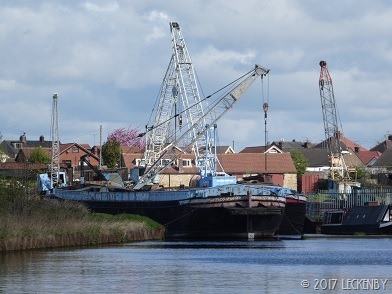 At the moment we can’t let it slip as we have to be at Keadby tomorrow night for the lock first thing Saturday morning. 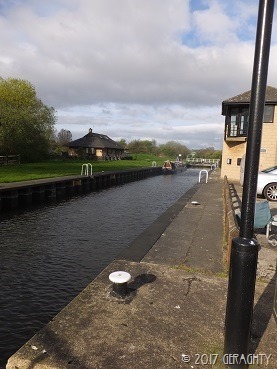 Yesterday we had short wide locks, but today we were into the big commercial locks of the South Yorkshire Navigation. These locks are operated by using the key of power (C&RT key), they have a panel at each end which operates the gates and sluices at that end. 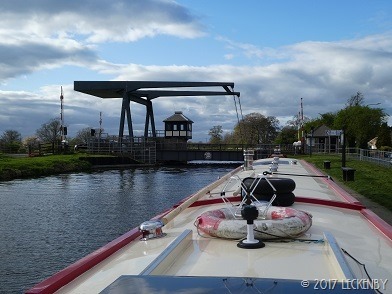 So once your boat is in the lock with the gates and sluices closed you have to walk the 60m or so to the other end to empty or fill it. Most locks reset themselves to being full after you have passed through them, but Eastwood Lock for some reason is always empty. 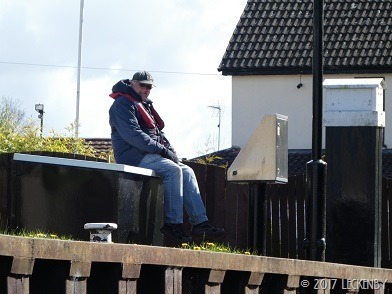 There is no speeding up the operation of the sluices from the panels lock side, I suspect a lock keeper can though from their observational control rooms. So it takes forever to fill these huge olympic sized locks to then spend ages emptying them, but at least they are easy to operate. Today we had stretches of river interspersed with locks, flood locks and cuts. 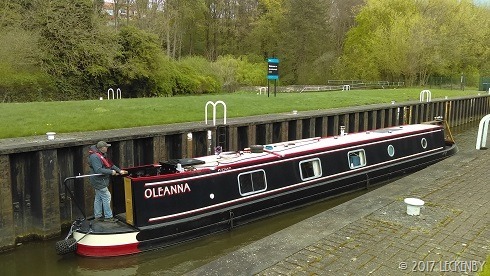 I stayed at the helm apart from at two locks, well I don’t want to hog all the manoeuvring of Oleanna and Mick could so easily get out of practice! 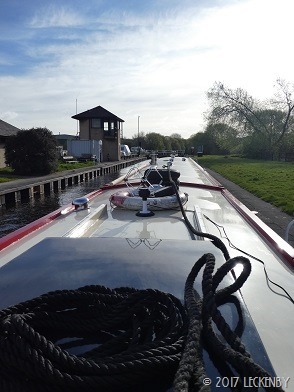 Our second lock today was Aldwarke Lock which takes you down onto a river section. I decided that I’d like to press the buttons on this one and stretch my legs, nothing to do with the lock landing being a bit awkward to get to round the corner. A C&RT chap was there painting the bollards. Now I know how it feels when people think they are being really original and funny when they say “You missed a bit!”, but this chap really had. I could envisage his frustration when he stood back to check his handywork after tidying away to see half a post still white. 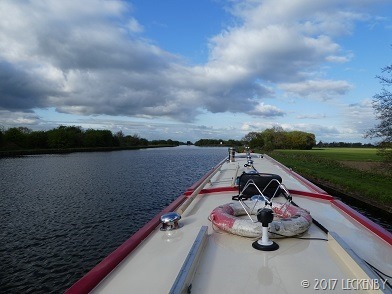 Once on the first stretch of river Mick decided to open up the throttle to see how Oleanna’s engine coped with higher revs, a kind of sea test before we hit the Tidal Trent on Saturday. She did well as we’d expected, looking behind our wash was minimal, but that could also have been due to the depth of water. Kilnhurst Flood Lock was level at both ends, but you still have to go through the motions of opening and closing gates to walk to the other end to do the same there. Around here was where we were meant to have reached yesterday, so we were only 1.5 hours behind. 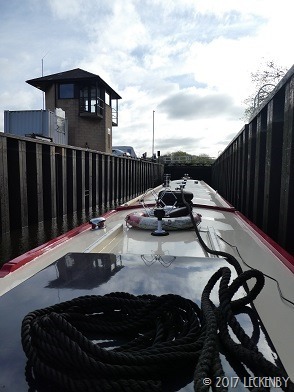 Through Waddington Lock where all the old work boats sit waiting for something to happen. One of them would make a gigantic home for someone, but I’d hate to think what a licence would cost. 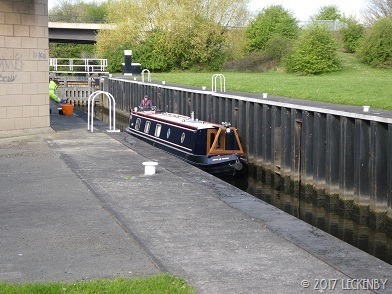 Between the Mexborough Locks we passed familiar boats, one of which may well have been in exactly the same position last year on the very long lock landing. The next stretch was long, so there was time to make a cuppa and put the dishwasher on. The batteries need to have recovered before things like the dish washer are put on and having a stretch where the engine wouldn’t be idling was useful. Our new cooker is excelling itself, it only takes marginally longer to use the stove top kettle than the electric. No more waiting around for 10 minutes for it to boil! Just wonder how much gas it’s getting through though. At Sprotbrough we thought of our friends Alison and Laura on NB Large Marge. They sing the praises of the butchers there every time we see them. We however had got side tracked at looking at the architecture of the church and missed the butchers completely. 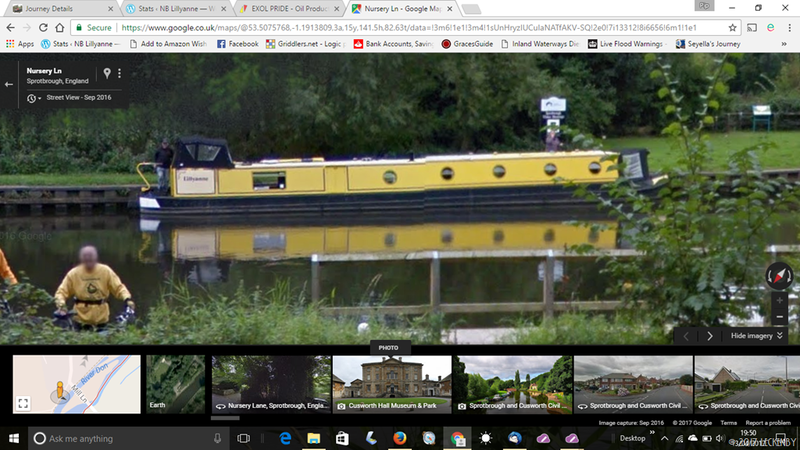 But then who appears on Google Street view, Mick at the stern, me by the bow and is that Tilly in a window! 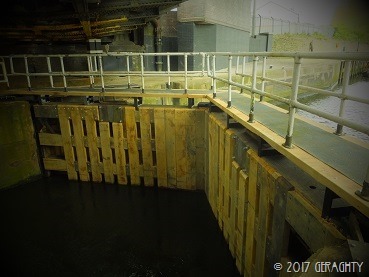 Doncaster Lock was closed for a month during the maintenance period and has very new bottom gates to show for it. 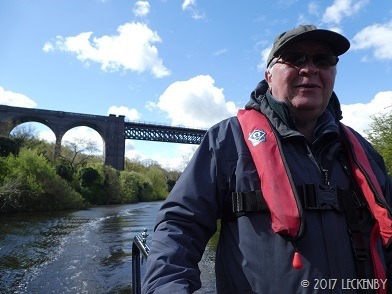 We had toyed with bringing Lillian back to Sheffield to swap boats there, but this closure got in the way and was possibly going to delay things. With hindsight it would have worked out for us. Our clock order had arrived in Thorne, we suddenly realised that the Post Office might be closed tomorrow with it being Good Friday. Today was the only time we’d be able to collect it and we were still a few hours cruise away. The only thing for it was to moor up and catch a train to Thorne. 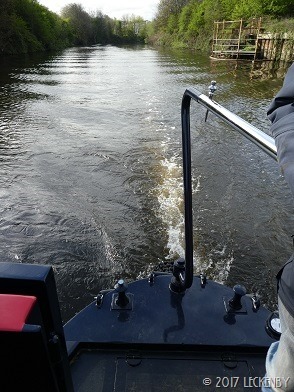 Once down Long Sandall Lock we pulled in and Mick made the journey to Thorne by train to pick it up. Sadly after all that it is a bit bigger than I’d thought! So still no clock. 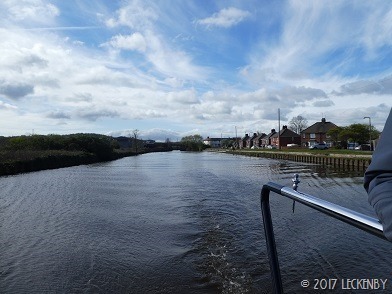 We pootled on a bit further under Barnby Dun lift bridge to where the New Junction Canal heads off north and the Stainforth and Keadby goes east. We are back in the land of big skys with views in both directions, we do like our new windows. After two days of seeing no moving boats this afternoon that has changed. Boats have been motoring past us from Doncaster, four in one convoy. They headed up the New Junction so if they take it in turns to work the bridges they’ll zoom along. 9 locks, 19.06 miles, 1 lift bridge holding up 27, 1 shouting cat, 0 people listening! 6 grease incidents, 1 set of new gates, 2 trains, 1 parcel, 10 inch not 8, 1 set fire irons, 6 passing boats, 5% to loose, 1 familiar mooring, 2 grins. This entry was posted in Uncategorized on 13th Apr 2017 by pipandmick.